Join Tidewater Community College for an evening under the stars with the Bard. 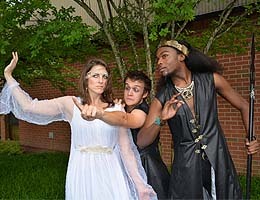 TCC Theatre will present “ A Midsummer Night’s Dream,” this year’s Shakespeare in the Grove production, on June 26-30 at 8 p.m. You don’t need a ticket, but you might want to pack a lawn chair and bring some bug spray. The outdoor theater on the Chesapeake Campus is at the corner of Cedar and Bells Mill roads. 0: What it costs to attend Shakespeare in the Grove. 1: TCC social science major Daquan Phillips (stage name London Terrell) is appearing in his first-ever play of any kind, noting he was too shy at Deep Creek High School to consider theater. He plays Oberon. 3: Yes, we already mentioned this number, as three “A Midsummer Night’s Dream” plays makes it the most for any Shakespeare in the Grove production. Three plots – the fight of the lovers, the plight of the major players and the hard-handed men vying to put on a play of their own – make this a memorable story, which is set in the woods and in the realm of Fairyland under moonlight (particularly fitting for outdoor theater). 5: Director Trey Clarkson has been part of five Shakespeare in the Grove productions, including the very first (“As You Like It”). The James Madison University graduate directs theater at Bishop Sullivan Catholic High School and directs the Barry Robinson Fine Arts Center. Says Clarkson, “Some people have fear with Shakespeare, so you have to direct them through that. 8: TCC grad Nick Bottom has been in eight shows (one of his roles was Macbeth). He has learned to be loud but effective with his dialogue. “You belt out your lines, but you have to find nuance, either physically or in pace of how you say the line because vocal levels, as far as volume, have to stay at 11,” he says. 30: The number of actors in “A Midsummer Night’s Dream,” including TCC graduates along with students from James Madison, Virginia Commonwealth University, Notre Dame, George Mason University, the College of William and Mary and homeschooled eighth-grader Jacie Murray. 617: Rehearsals moved outdoors on June 17. Prior to that they were in the indoor theater on the Chesapeake Campus; actors have rehearsed since May 13 four nights a week, three hours each. 1594: The earliest mention of “A Midsummer Night’s Dream.” No one knows the exact date the play was written.